In three spa-worthy fragrances — Shimmer, Blue Grotto and Pineapple Coconut Vanilla — just in time for the holidays! Relaxing in a hot bath soothes the body and the mind. Our new Scentsy Soak now gives you even more reason to sigh aaahhh at the end of your day! Each Scentsy Soak comes to you in a 2-pound bag, enough for multiple uses — making it a great value at only $12 USD/$16 CAD per bag. Any selection from our Scentsy Body line delivers fragrance that feels good. We’re proud to offer you this exciting new choice! Scentsy Soak is a limited-time bath product comparable to a fragranced bath salt. In addition to Pink Himalayan and Epsom salts, Scentsy Soak is formulated with premium moisturizers — a luxurious blend of aloe and sunflower oil — and, of course, our exclusive fragrances. What are the benefits of using Scentsy Soak? Scentsy Soak is designed to soothe tired muscles, moisturize your skin and help you relax as you bathe — all while enjoying authentic Scentsy fragrances. How long will Scentsy Soak last? Scentsy Soak comes in a 2-pound bag, enough for 3-5 uses when adding 1-2 cups to water per bath. What are the main ingredients in Scentsy Soak? Scentsy Soak contains Pink Himalayan and Epsom salts, aloe and sunflower oil, all infused with signature Scentsy fragrances. How long does it take for the salts to dissolve? The salts will dissolve at varying rates depending on the amount of bath water and its temperature. Initially, you may notice granules of salt on the bottom of the tub; this is normal. Where is Scentsy Soak made? Scentsy Soak is made with love in Idaho. What makes Scentsy Soak different? Scentsy Soak is formulated not only with bath salts, but premium moisturizers such as aloe and sunflower oil, resulting a relaxing, skin-pampering bath experience. How long will Scentsy Soak be available? Scentsy Soak is available for a limited time only while supplies last. Will Scentsy Soak color my bathtub? In our evaluation, we have not experienced this issue. Scentsy Soak is made with water-soluble colors to provide a beautiful as well as fragrant experience. Does Scentsy Soak contain ingredients that may cause skin irritations? Scentsy Soak is infused with fragrance. If you have known skin sensitivities, dissolve Scentsy Soak in bathwater and test it on a small area of your skin. If irritation occurs, wash off the area with clean water and discontinue use. If irritation occurs during or after bathing, rinse with clean water and discontinue use. What fragrances is Scentsy Soak available in? Scentsy Soak is available in popular fragrances, and they are Limited Time Only. Check this page to see what’s available today. How much Scentsy Soak should I add to my bathtub? Pour desired amount under warm running water. For best results, add about 1-2 cups, depending on the size of your bathtub. Do you have samples of Scentsy Soak? Will Scentsy Soak stain my skin? Tests have shown Scentsy Soak does not stain the skin. Fragrance duration varies, but you’ll be able to smell Scentsy Soak in your bathroom hours after use. Scentsy Soak comes in a 2-pound bag (32 ounces). Is Scentsy Soak free of parabens and sulfates? Scentsy Soak is paraben-free but not sulfate-free. Sulfates help create the fun foaming action. Where can I get Scentsy Soak? Secure online ordering for UPS delivery to your door here. Our handcrafted Bath Bombs offer more than just a pretty fizz. Inspired fragrances soothe your senses while premium vitamin-rich moisturizers help nourish and soften your skin. 5.3 oz. Available at www.IncomeWax.com you’ll be able to get your hands on Scentsy’s new bath bombs. I am a die-hard fan of LUSH bath bombs. I honestly didn’t think we’d be able to compete with Lush. But guess what? We’re not trying to compete; as always, we’re just offering our innovative, high quality products and I can say from first hand testing experience, I’m sold. Sorry Lush, I’m leaving you. Scentsy’s bath bombs are handcrafted and so much more than just pretty fizz. Our fragrance experts handcraft each Scentsy Bath Bomb at our state-of-the-art facility in Idaho. You won’t find any bulk, mass produced machine cranking these out. They’re hand pressed in small batches to ensure the highest quality and performance — which is why Scentsy Bath Bombs are in limited quantities and available only while supplies last! Top of my list in features and benefits, is the feel. After using a Scentsy bath bomb, my skin is left feeling incredibly silky smooth. Each Bath Bomb is formulated with our proprietary blend of premium vitamin- and antioxidant-rich ingredients to help moisturize and soften your skin. Premium ingredients include sunflower oil, aloe vera, shea butter, kaolin and olive oil. You won’t find another bath bomb on the market that is scented as fabulously as Scentsy’s. Our bath bombs come in some of our most popular fragrances. Remember, quantities are limited and they also make great stocking stuffers and teacher gifts. Shop Now before supplies fizzle! Scentsy Bath Bombs: More than just pretty fizz. Our handcrafted bath bombs are the perfect blend of vitamin-packed, antioxidant-rich moisturizing ingredients such as sunflower seed oil, olive oil, kaolin clay, shea butter and aloe. We infuse these ingredients with just the right amount of authentic Scentsy fragrance, leaving you refreshed and relaxed — and your skin amazingly soft. Because they’re made in small batches, Scentsy Bath Bombs are limited in quantity and available only while supplies last. In our evaluation, we have not experienced this issue. They are made with water soluble colors to provide a beautiful, as well as fragrant, experience. As with all skin-contact products, there is a chance of a mild reaction. If you have sensitive skin, you may consider testing on a small area of skin before full use. Is there glitter or a surprise inside? One bomb per bath is recommended, but feel free to combine fragrances as desired. If you have a large bathtub, you may consider using a second for added fragrance. These products have been tested and do not cause skin staining. What is the shelf-life of bath bombs? Our bath bombs are paraben-free, but not sulfate-free. The sulfates help create a fun foam and cleansing. Are bath bombs available for half-price and free Host Rewards? As with any product, we will evaluate the success and determine whether or not it makes sense to offer additional fragrances. Where can I order some Scentsy Bath Bombs? It’s been years since anyone stopped to ask me about my cologne. He was an older gentleman and I’m pretty sure from his reaction he had no idea what Scentsy was. 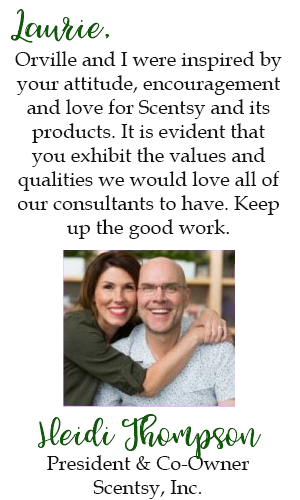 Did You Know Scentsy Has Perfume? We currently have Fragrance Rollers in 12 delightful scents. That’s a dozen more reasons to be stopped to ask what scent you’re wearing. The 10mL is small enough to fit into any purse, backpack or pocket, yet packed with scent, so a little dab is all you need. Don’t forget Mother’s Day is May 13,2018. Treat Yo Self! 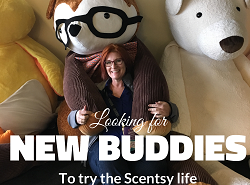 With a new Scentsy Buddy to love, you just know it’s going to be a GOAT day! Glendon the Goat is brimming with charm from his cute little beard to his adorable horns. And he’s ready to join your herd! But you’d better hurry! Glendon is only available while supplies last. Every Scentsy Buddy features a zippered pouch to hold your favorite fragrance. Glendon the Goat is $25 and comes with the Scent Pak of your choice. The newest addition to our Buddy Clothing line is the I Feel Lucky T-shirt. * It’s perfect for St. Patrick’s Day, but really, it’s cute enough to wear year-round! And it’s sure to make you say, “Irish I had one of those!” Add this shirt to your favorite Buddy’s closet for only $5! You can never have too many goat jokes. What do you call a goat that knows martial arts? Goat on a limb and open the door.